Marissa Meyer has done it again! I absolutely love the way she is able to turn a beloved fairytale and make it unique and her own. For some reason I didn't think that we would get much Cinder in this book and I am extremely happy that I couldn't be more wrong. I absolutely love Scarlet and I couldn't be happier with her introduction to this saga. 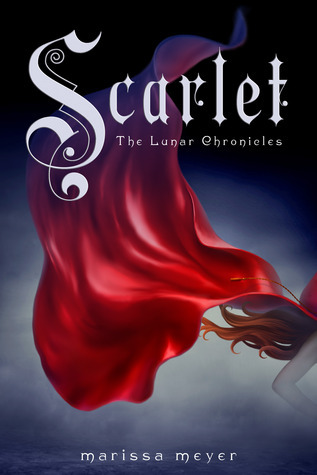 Whereas Cinder was a lot more timid and shy in her book, Scarlet from the start was headstrong and not afraid of going after those who kidnapped her grandmother. She was ready for whatever she might face, and I absolutely loved that about her. The story of Scarlet continues pretty much right after the events of Cinder and when you see Cinder again she is in the middle of breaking out of New Beijing after being thrown in there by Kai and Queen Levana. She meets and teams up with another prisoner "Captain" Carswell Thorne. He was probably my favorite new addition, besides Scarlet. He was overall hilarious and gave a handful of comedic relief to the story. Wolf, a street-fighter that Scarlet meets and gets help from, was the main love interest in this story. He was dark, mysterious, and extremely broody but I really enjoyed him. The blossoming relationship between him and Scarlet was definitely swoon-worthy at times and I couldn't help but feel giddy. I really loved how the book was broken down between what was happening with Scarlet and Cinder, but even though it felt like separate story arcs, the two molded into one flawlessly. This book was a great continuation of Cinder and I cannot wait until I get my hands on Cress. I'm interested to see how another main character is introduced and how Cress' storyline will tie into Cinder's and Scarlet's. This series is quickly becoming one of my favorites!